4026 2125 Laser Hot Hits. Dave Norris reading report from Norway, Ultravox "Dancing With Tears in My Eyes." SINPO 44433 via Twente SDR receiver. Bruegman -- who does not currently hold an Amateur Radio license -- was operating in the phone portion of the 20 meter band that is assigned to the Amateur Radio Service on a primary basis; his Amateur Radio license expired in 2010. As a former Technician class licensee, he did not have privileges to operate in that portion of the 20 meter band when he held an Amateur Radio license. Here are a couple of QSLs received recently from Dutch stations, Radio Norton and Radio Pioneer. Thanks very much! 4026 2130 Laser Hot Hits. Mike Andrews show. ELO "Rain is Falling," peaking at S9+20dB via Twente SDR receiver. SINPO 54444. 4026 2138 Laser Hot Hits. Ian Lawrence show. Flock of Seagulls "Wishing I Had A Photograph of You," then Thompson Twins. Strong signal via Twente SDR receiver. SINPO 54444. If you are interested in the Dutch medium wave pirates a good site to check out is Wizard's medium wave free radio blog, where he regularly posts logs, recordings and other interesting material. I'm always impressed with his success at pulling in the signals from the Netherlands. 4026 0935 Laser Hot Hits. Manic Street Preachers "Design for Life," fair signal. SINPO 34333. 5780 0855 Radio Focus Int. "I Saw the Light" then Style Council "Reach for the Top", also on 6285 with different programme. SINPO 34333. 5800 0900 FRS Holland. FRS Magazine with Peter Verbruggen, Adamski "Killer," also on 6070, 7685. SINPO 34333. 6045 0925 Radio Iceman via Media Broadcast. ID, then "It Takes Two," strong. SINPO 55444. 6070 0920 FRS Holland (via Radio 6150?). "Is this Love," weak signal. SINPO 24332. 6201 1032 Radio Likedeeler. Spelling out name, rock music. Fair signal. SINPO 34333. 6210 1241 Radio Borderhunter. IDs and greetings, 10cc "Dreadlock Holiday." SINPO 54444. 6210 1700 Sluwe Vos Radio. "Convoy", ID and greetings. Fair. SINPO 34333. 6218 0945 Radio King SW. Oldies, poor modulation. SINPO 34332. 6245 1122 Radio AC DC. Rock music, fair signal. SINPO 34333.Moved to 6210 at 1140 to avoid QRM. SINPO 34333. 6285 0930 Radio Focus Int. Offshore radio documentary. Strong. SINPO 54444. 6300 0915 Radio Waldmeister. Oldies, fair signal. SINPO 34333. 6306 1100 Radio Python. Magic Numbers song, weak-fair. SINPO 24332. 6306 1613 BZN Radio. Cliff Richard "Congratulations", BZN songs. SINPO 34333. 6325 1127 Radio Norton. Dutch instrumental music, weak-fair. SINPO 24332. 6326 1638 Radio Veronica. Middle Eastern sounding pop music, canned IDs. SINPO 34333. 6449 1627 Studio 52. Dutch songs, ID through the pirate chatroom. SINPO 44433. 6450 0910 Radio Universe. "Railroad Man" then "Pretty Flamingo." SINPO 44333. 6450 1118 Radio Zwarte Panter. Polka, fair-good signal. SINPO 34333. 6735 Hot Radio (formerly Cool AM). Rolling Stones special. Fair via Twente SDR receiver. SINPO 34333. 6745 1045 Radio Pink Panther via Radio Pioneer. Goombay Dance Band "Seven Tears," fair signal. SINPO 34333. 6937 0940 IMR. Human League "Love Action." Fair. SINPO 34333. 7685 0902 FRS Holland. FRS Magazine, also on 5800, 6070. SINPO 55444. 4026 0925 Laser Hot Hits. Four Tops then Robert Plant songs, fair signal. SINPO 34333. 5780 0905 Radio Focus Int. Offshore radio documentary, not parallel to 6285. SINPO 34333. 6207 1557 Radio Morning Star. Country music, using 12W. SINPO 24332. 6210 0915 Radio Quintus. Polka, ID and greetings. Good signal. SINPO 44433. 6215 1628 Radio Klabautermann. German music, fair signal but some utility splash. SINPO 33333. 6216 1110 Radio King SW (tent). Kim Wilde "You Came", modulation sounding a bit better this week. SINPO 34333. 6235 1128 Sluwe Vos Radio. Dance music, ID jingle, utility splash from 6230. SINPO 33333. Heard on 6250 at 1153 - SINPO 34333. 6243 1427 Radio AC DC. Lynryd Skynrd "Sweet Home Alabama", fair signal but some utility QRM. SINPO 33333. 6250 1555 Radio Flying Dutchman. Donna Summer "I Feel Love", utility & SSB QRM. SINPO 43433. 6265 1513 Cupid Radio. ID, greetings, dance tune, then Joan Jett "I Love Rock n Roll." SINPO 54444. 6285 0910 Radio Focus Int. The Alarm "68 Guns" and Nena "99 Luftballons." Strong, not parallel to 5780. SINPO 54444. 6294 1559 Free Radio Victoria. Alan Parsons Project, ID, then Dire Straits. SINPO 44433. 6295 0957 Radio Osaka. Rock n roll, fair signal. SINPO 34333. 6299 1437 Radio Underground. Jean Michel Jarre music, ID. Strong. SINPO 54444. 6300 1604 Radio Contact. A-Ha "The Sun Always Shines On TV," canned IDs, fair-good signal. SINPO 34333. 6306 1155 Radio Malibu. Techno music, ID and greetings. Fair. SINPO 34333. 6307 1740 Radio Witte Reus. Jazz-type music, fair signal but signals starting to fade. SINPO 34333. 6313 1611 Radio Digitaal. Toto "Africa," good with strong peaks. SINPO 44433. 6320 1520 Radio Mustang. Dance music, strong. SINPO 54444. 6325 1133 Radio Zodiac. IDs and email address, rock music, good audio. SINPO 34333. 6430 1525 Radio Zwarte Panter. Country music, good signal. SINPO 44433. Heard on 6450 at 1540 - stronger. SINPO 54444. 6430 1535 Radio Sallandse Boer. Report to Zwarte Panter, country music. SINPO 54444. 6450 0952 Radio Readymix. Shocking Blue "Venus", fair-good but SSB QRM. SINPO 33333. 6553 0930 Radio Pink Panther. Demis Roussos "For Ever and Ever," ID and greetings. SINPO 34333. 6745 0935 Radio Pioneer. Dutch music, weak-fair signal. SINPO 24332. 6745 1417 Radio Pink Panther. Eddie Grant "Give Me Hope." SINPO 34333. 6904 1018 Misti Radio. Oldies, weak signal. SINPO 24332. 6937 1005 IMR. "Breaking Down the Walls of Heartache," fair signal. SINPO 34333. 4026 1803 Laser Hot Hots. Dave Norris programme. "Castles in the Sky," chatting with female DJ. Good signal but whistle from carrier on 4025. SINPO 43433. Whistle stopped 1820 ... improved to 44444. 6210 1605 Radio Goudenster. Polka, IDs and greetings in Dutch and English. SINPO 34333. 6245 1619 Radio Morning Star. Country music, weak-fair. SINPO 24332. Heard on 6250 at 1705. Utility QRM. SINPO 23332. 6265 1555 Radio Python. Testing new transmitter, using 10W, The Killers "Smile Like You Mean It." Weak-fair. SINPO 24332. 6285 1655 Radio Black Arrow. Pet Shop Boys "West End Girls," ID and greetings. Good-strong signal. SINPO 54444. 6290 1550 Radio Malibu. Dutch music, fair. SINPO 34333. 6295 Radio Digitaal. Dutch country music, good signal, few IDs. SINPO 44433. 6304 1540 Radio Vendor. OMD "Joan of Arc" then Dutch song. Good signal. SINPO 44433. 6985 1645 Lightning Radio. Florence & The Machine song, ID jingle, fair via Twente SDR receiver. SINPO 34333. 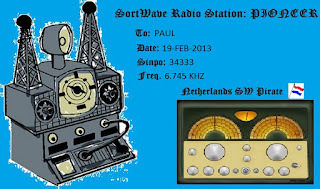 The Free Radio Service Holland have planned a full 5-hour broadcast this upcoming Sunday, February 24th. In preparation to that, we tested on 7685 kHz last Sunday February 17th: results were satisfactory and we are confident next Sunday a good signal will be aired over the European airwaves. Next Sunday FRS-Holland will be on air between 08:52-14:00 UTC/ 09:52- 15:00 CET. The broadcast is on 5800//7600 kHz and on 6070 kHz/ 49 metres as well. Programme line-up includes all FRS presenters (except Paul Graham) and consists of FRS Magazine, the German Service, FRS Goes DX , Radio Waves and the FRS Golden Show. Ingredients....great music, DX News (also in the German Show! ), letters, the day calendar and a number of radio related items. In addition we pay tributes to two FR persons who recently passed away (German Show, FRS Goes DX part 2). It will be worth while. FRS-Holland brings true free radio into your receiver! Tune in.... Radio entertainment on a Sunday! That same day between 14:52-20:00 UTC/15:52- 21.00 CET will see a full repeat on the Internet. Check on your computer < http://nednl.net:8000/frsh.m3u >. For mobile devices there is a 24 kbps mono stream: [helios.cloudnl.net:8000/frsh24.m3u] or [ http://nednl.net:8000/frsh24.m3u]. Please only use frs@frsholland.nl for your mails. 4026 1840 Laser Hot Hits. Ian Lawrence talking about 80s compilation albums, a version of "Rawhide" then "Lean on Me." SINPO 34333. 6264 1725 Radio Zeewolf. Rock n roll, then Simple Minds song, poor signal with utility QRM. SINPO 23332. 6282 1655 Radio Digitaal. Cher "If I Could Turn Back Time", IDs in Dutch, some slight utility QRM. Good with strong peaks. SINPO 44433. 6285 1550 Odynn Radio. ID, instrumental and Dutch music. Fair signal. SINPO 34333. 6295 1558 Radio Altrex. Dutch songs, moo sounds. SINPO 34333. 3905 1810 Radio Alice. Techno version of "Living Next Door to Alice", ID and off at 1813. Fair signal. SINPO 34333. 4026 2305 Laser Hot Hits. Current pop & rap music, fair signal. SINPO 34333. 6300 1735 Radio Merlin Int. Pre-recorded shows, Chris de Burgh "Lady in Red." Good signal. SINPO 44433. 6745 1740 Radio Pioneer. Dutch songs, jingles with ID and email address. Fair reception. SINPO 34333. 1620 2150 Greek station. Talk in Greek with Greek folk music. SINPO 44333. 1638 2135 Radio Calypso. "Whiter Shade of Pale", splash from strong station 1644. SINPO 53443. 1644 2140 Radio Vrolijke Mijnwerker. "Brown Eyed Girl" Van Morrison, non-stop music, no IDs heard while I was listening but Carolineteam logged the Happy Miner. Splash from 1638. SINPO 53443. 4015 0855 Laser Hot Hits. Rap song "Missed the Bus," then Level 42. Good signal. SINPO 44433. 6005 0935 EMR via Radio 700. Mailbox show, reading listeners' reports. Police "Everything She Does is Magic." SINPO 34333. Also on 9480. 6200 0959 Radio Technishe Man. ID in Dutch, Boston "More than A Feeling." Strong. SINPO 54444. 6200 1328 Radio Borderhunter. After short QSO with Python, "Ring of Fire" then Kim Wilde "Cambodia." SINPO 54444. 6205 0842 Radio Orang Utan. ID, Louis Armstrong "What A Wonderful World." SINPO 34333. 6213 1200 Radio Pandora. Recordings of Free Radio Santa Cruz, occasional ID jingles. Good to hear Pandora back on the air. SINPO 34333. 6240 1034 Radio Zeewolf. ID, pop music. SINPO 34333. 6250 1655 Radio Viking. Dutch songs, Tante Foek singing along. Strong along, some utility QRM. SINPO 54444. 6285 0945 Radio Flying Dutchman. Jingle ID, greetings, Dutch songs. SINPO 44444. 6285 1245 Radio Python. Bjork song, weak-fair. SINPO 24332. 6301 1040 Radio Bonofox. John Farnham "You're the Voice. ", SINPO 34333. 6305 1115 Radio Merlin Int. REM "Everybody Hurts," ID from Jackie Frost. SINPO 34333. 6305 1250 Radio Odynn. Dutch songs. SINPO 34333. 6320 0923 Radio Rainbow. ID, email, Rod Stewart "Sailing." SINPO 33333. 6326 1700 Radio Caroline Int. ID jingles, pop/dance. Fair signal. SINPO 34333. 6446 1415 Radio Sallandse Boer. Golden Earring "Radar Love," QSO. SINPO 54444. 6450 0846 Radio Universe. "World Without Love," The Sweet "Dynamite." Good signal. SINPO 44433. 6450 1423 Radio Baken 16. QSO. SINPO 34333. 6452 1417 Radio Powerliner. QSO. SINPO 44433. 6452 1438 Radio Lowland. QSO. SINPO 54444. 6530 1710 Radio Joey. Smokie "Living Next Door to Alice," weak. SINPO 24332. 6540 1705 Radio Morning Star. Country music. SINPO 24332. 6553 1357 Radio Pink Panther. U2 "Sunday Bloody Sunday", fair. SINPO 34333. 6937 0928 Irish Music Radio. Martha & The Vandellas "Dancing in the Street," SINPO 34333. 7629 0950 Free Radio Victoria. Johnny Cash "Ring of Fire," ID, fair signal. SINPO 34333. 7685 1100 Unid. "Winter in America" then Queen "You're My Best Friend." No IDs, possible the Radio Star/FRSH relay transmitter being tested. SINPO 54444. 9480 0937 EMR via MV Baltic Radio. Mailbox programme. SINPO 24332. Also on 6005. 9480 1007 Radio Geronimo SW via MV Baltic Radio. "I've Been Waiting for a Girl Like You," fair signal. SINPO 34333. Arvid in Norway sent me a recording he made. He writes: "I just wondered if you could help me to identify this jingle, which is infact an e-mail address ? Heard today (Feb 14) at 13.07 UTC on 6305 kHz with good signal. I couldn`t really get the first part of the jingle, the last part is gmx.net." I have listened and also can't ID the name of the station. Can anyone help? 4026 0955 Laser Hot Hits. Al Stewart "Road to Moscow," then Tangerine Dream "Kaleidoscope." Good with strong peaks. SINPO 44433. 6218 0940 Radio King SW (pres). Oldies, usual poor modulation. SINPO 34332. 6240 1448 Radio Flying Dutchman. Instrumental music, ID and greetings. SINPO 44433. 6255 1410 Radio Biscaya. "Baby Come Back," and Boney M "Belfast." Fair signal. SINPO 34333. 6260 0938 Radio Soundwave. Pop music, close down with no announcement, slight het. SINPO 34333. 6285 0947 Radio Flying Dutchman. "Silence is Golden", greeting to listeners. Good signal. SINPO 44433. 6285 1358 Radio Osaka. ID and Dutch songs. SINPO 34333. 6290 1257 Radio Orang Utan. ID and email address, oldies. Weak. SINPO 24332. 6295 1434 Radio Casanova. Dutch songs, IDs, strong signal. SINPO 54444. 6325 0924 NMD Radio. ID jingle, QSO. SINPO 44433. 6325 0928 Radio Black Arrow. QSO. SINPO 44433. 6325 0931 Radio Malibu. QSO. SINPO 34333. 6430 0943 Radio Zwarte Panter. Dutch songs, good signal with strong peaks, slightly overmodulated. SINPO 44433. 6555 1020 Radio Joey. Dance music, weak signal. SINPO 24332. 6937 1005 IMR. REO Speedwagon "Take it on the Run" and T'Pau "China in My Hand." Fair-good. SINPO 34333. A man has been arrested in a raid on a pirate radio station in Wolverhampton. Police and officials from communications regulator Ofcom raided the premises in Crowther Street, Park Village, early on Wednesday. Equipment was also seized, including a microphone, a mixing desk, a computer and electrical cables. Police said a man, 33, from Dudley, was arrested on suspicion of offences under the Wireless Telegraphy Act 2006. He has been released on bail. on 1368 kHz, and also repeated on Saturday February 16th at 09 - 10 UTC on 9510 kHz. On Saturdays a separate programme via R Merkurs in Riga , Latvia on 1485 kHz at 20 - 21 UTC. Also via Hamburger Lokalradio on the 4th Saturday of the month on 7265 kHz at 13 - 14 UTC. All reports to: geronimoshortwave@hotmail.com; Thank you! 6210 1450 Radio Goudenster. Country music. Weak-fair. SINPO 24332. 6285 1315 Radio Flying Dutchman. Dutch songs, fair signal. Moved from 6282. SINPO 34333. Heard on 6265 at 1415, SINPO 34333. 6285 1444 Radio Osaka. Accordion music, fair. SINPO 34333. 6295 1305 Radio Altrex. Dutch songs, 'moo' sound effects. Fair. SINPO 34333. 6306 1420 Radio Malibu. Dutch music, ID and email address. Fair. SINPO 34333. 6553 1425 Radio Pink Panther. Dr Hok "If I Said You Had A Beautiful Body." SINPO 34333. 6745 1430 Radio Pioneer. Country and Dutch music. Fair. SINPO 34333. 1655 2147 Radio Vrolijke Mijnwerker (Happy Miner). ID in English, greetings, Dutch song. Strong via Twente. SINPO 54444. 4026 2115 Laser Hot Hits. Dance music, "Promised Land," song. 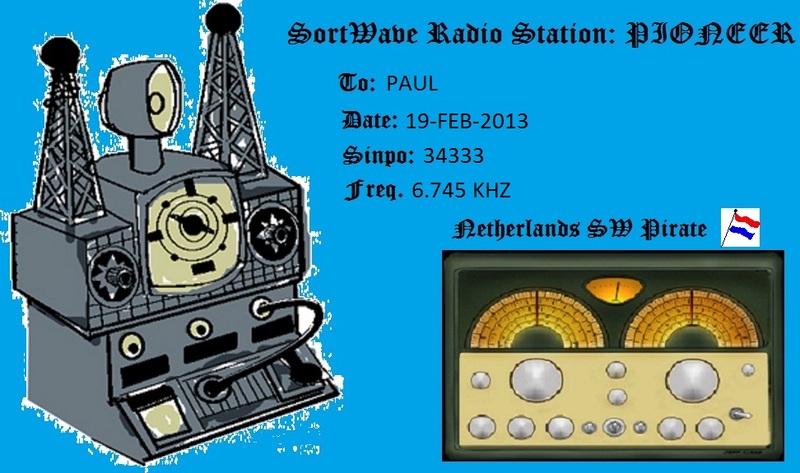 Good via Twente SDR radio. SINPO 44433. 4026 0925 Laser Hot Hits. Gary Show show. EastEnders rap tune. SINPO 44433. 6205 0930 Radio Soundwave. Soft rock, fair signal. SINPO 34333. 6210 1340 Radio Goundenster. Country and Dutch music. SINPO 34333. 6215 1005 Radio King SW. Oldies, poor modulation. SINPO 34332. 6245 1400 Radio Python. Music just above noise level. SINPO 24332. 6250 1635 Sluwe Vos Radio. Kraftwerk "Radioactivity," Boney M "Ma Baker," ID. SINPO 34333. 6282 1405 Radio Flying Dutchman. Female vocal, good signal. SINPO 44433. 6285 1036 Radio Ascona. IDs and talk, Dutch music. Weak with fair peaks. SINPO 24332. 6285 1355 Trans Europe Radio. Oldies, using 25W, weak to fair. SINPO 24332. 6285 1725 Radio Osaka. ID jingle, Dutch songs. SINPO 34333. 6295 1050 Radio Poema. ID and greetings, testing new dipole weak-fair, SINPO 24332. 6295 1455 Radio Rainbow. Talk about peace and democracy, Eddy Grant "Living on the Frontline." SINPO 44433. 6300 1520 Radio Telstar. Dutch music, ID and greetings. Good signal. SINPO 44433. 6305 1024 Radio Merlin Int. "Dance to the Music," only using 10W, good signal with strong peaks. SINPO 44444. 6305 1450 Radio Malibu. Dutch music, IDs, weak-fair. SINPO 24332. 6307 1650 Radio Caroline Int. Pop and dance music, ID jingles, strong SSB QRM. SINPO 32332. 6325 1350 Radio AC-DC. Rock music. Fair. SINPO 34333. 6325 1700 Radio Mustang. Boston "More than a Feeling," ID and greetings. SINPO 54444. 6445 0959 Radio Zwarte Panter. ID and email address, Dutch song, slightly overmodulated. SINPO 44433. 6449 1548 Studio 52. Dutch songs, fair signal. SINPO 34333. 6553 0946 Radio Pink Panther. Country music, fair-good signal. SINPO 34333. 6745 0953 Radio Pioneer. Dutch songs, IDs, SSB QRM. Weak-fair. SINPO 23332. 6925 1625 Station QRP. "The Love I Lost," ID jingle. SINPO 34333. 6937 0940 IMR. Warlord "Ultimate Warlord" and Supertramp "It's Raining Again." SINPO 44433. 1630 2015 Radio Schaduwjager. "Queen of Hearts" ID, then "Big in Japan." Strong via Twente SDR receiver. SINPO 55444. 1638 2005 Radio Calypso. Dutch songs, ID, greetings in Dutch and English. Splash when Schaduwjager came on. SINPO 54444 via Twente. 1646 2025 Radio Soerabaya. Polka, IDs in Dutch and English, greetings to Paradiso and listeners. Fair reception via Twente. SINPO 34333. 4026 1950 Laser Hot Hits. Gary Drew programme. EastEnders novelty rap record. Good signal via Twente SDR receiver. SINPO 44433. 4026 2255 Laser Hot Hits. Gary Drew show. Sending out greetings, rap, soul, funk music. Fair via Twente SDR receiver. SINPO 34333. Radio Dinosaur heard on 846 1308 (Sunday) with Paper Sun then talk. Fair and above local noise level using a Sony 7600G, Anoraks UK loop + DMA. Speech level seemed a bit lower than the music so couldn't follow all of it. Some splash from 837, also the Cranfield Air Beacon on 850 audible. They have been on a few times during December and January, first using 819 then 846. DJ Dino announces broadcasts on the Garry Stevens Pirate Free Radio Board. 4026 0913 Laser Hot Hits. Supertramp "Breakfast in America" and Donna Summer "This Time I Know It's For Real." SINPO 34333. 6200 0848 Radio Orang Utan. Jason & Kylie "Especially for You," weak-fair with splash from 6210. SINPO 23332. 6200 1100 Radio Likedeeler. IDs, rock music. Fair but splash 6210 and slight whistle. SINPO 33333. 6210 0905 Radio Marabu. Blues rock, talk in German. SINPO 44444. 6217 0947 Radio King SW (pres). Difficult to follow due poor modulation. SINPO 34332. 6240 0942 Radio Grutte Pier. CW McCall "Convoy", polka, fair. SINPO 34333. 6242 1505 Radio AC-DC. "Something About You Baby I Like," "Rawhide", ID and greetings. SINPO 34333. 6250 0957 Radio Condor. Techno music, IDs and talk in Dutch. SINPO 34333. 6250 1630 Sluwe Vos Radio. Pop oldies, good signal. SINPO 44433. 6255 1358 Radio Blueman. "Jump Around," then "The Power", strong. SINPO 54444. 6260 1030 Radio Scotland Int. ID and greetings, "Classical Gas." Strong. SINPO 54444. 6260 1415 Free Radio Victoria. Dire Straits "Walk Away", good signal but splash 6255. SINPO 43433. 6268 1452 ROZ. "King of the Road", utility splash from 6275. SINPO 43433. 6280 0925 Radio Luxemburg. Hollies "Air That I Breathe." Strong. SINPO 54444. 6285 1433 Radio Osaka. Dutch songs, fair. SINPO 34333. 6294 1425 Radio Odynn. Instrumental music, polka. SINPO 34333. 6300 0938 Radio Flying Dutchman. Dutch songs and accordion music. SINPO 44433. 6301 0855 Radio Bonofox. Stylistics "You Make Me Feel Brand New," fair. SINPO 34333. 6305 1500 Radio Malaisy. Rap version of "Life is Live," then quick jingle ID. Good with strong peaks. SINPO 44444. 6322 1440 Radio Python. Sounded like rebroadcast of US talk show but weak-fair signal so not easy to follow. SINPO 24332. 6326 1640 Radio Caroline-Rainbow. "Endless love," IDs, fair reception. SINPO 34333. 6375 1448 Radio Witte Reus. Depeche Mode "Enjoy the Silence," SINPO 34333. 6445 1048 Radio Zwarte Panter. Dutch music, fair to good signal but overmodulated. SINPO 34333. 6450 0920 Radio Universe. Queen "I Want It All," fair-good. SINPO 34333. 6553 1053 Radio Pink Panther. Hot Chocolate "Emily." SINPO 34333. 6942 0932 IMR. Bee Gees "Staying Alive," and Goombay Dance Band "Seven Tears," fair-good. SINPO 34333. 3905 1703 Radio Alice. "We Love the Pirate Stations," ID. Fair signal. SINPO 34333. 4026 0855 Laser Hot Hits. Gloria Gaynor "I Will Survive," fair signal. SINPO 34333. 6210 0840 Radio Marabu. Level 42 and Steely Dan songs, strong but slightly overmodulated signal. SINPO 54444. 6285 1550 Radio Osaka. Dutch songs. Fair. SINPO 34333. 6285 1636 Radio Digitaal. QSO with Osaka, spelling out email address. SINPO 34333. 6307 1540 Radio Caroline Int. Pop music, ID jingles. Fair. SINPO 34333. 6553 1148 Radio Pink Panther. Iggy Pop "Lust for Life," then T Rex. Fair. SINPO 34333. 6745 1625 Radio Pioneer. Dutch music, ID and email address. SINPO 34333. 6942 1142 IMR. The Nolans "I'm in the Mood for Dancing," fair. SINPO 34333. 3905 2140 Skyline International Radio. Dutch music then Dire Straits "Walk of Life," fair reception. SINPO 34333.